The Man in Black: The Legend of Dale Earnhardt. It was on the third lap of the 2002 Daytona 500 that the tribute began. Fans stood silently as the NASCAR field thundered on. 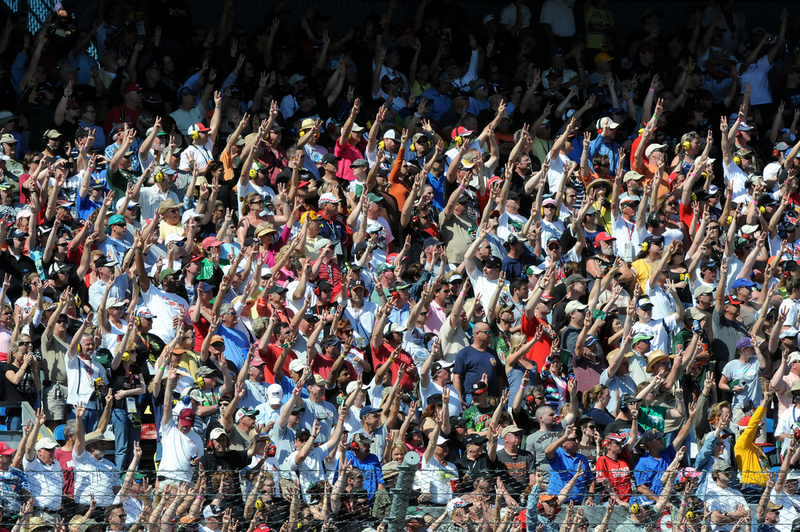 Fittingly the leading cars, the silver 29 and the NAPA 15 were both owned by Dale Earnhardt Incorporated – and the fans held hands aloft with three fingers high. The intent was to remember friends and heroes but at that moment they had only one man in mind. Dale Earnhardt, the man in black (so named because of the black Goodwrench livery of his No.3 Chevrolet Monte Carlo) had lost his life towards the end of the previous years’ event, taking away the life of the NASCAR’S most storied driver. A wander around infield tells the story. The most common decal by a long way is the black and white 3 of seven-time series champion Dale Earnhardt. OAfter Dale’s death the commemoration business want crazy, from the glossy black Monte Carlo SS Dale Earnhardt Signature Edition saloon car down to T-shirts, leather jackets, wind chimes, scented candles and ceramic bottle stoppers. There’s even a shotgun or two with an engraved barrel. All tasteful, like. Nothin’ fancy. 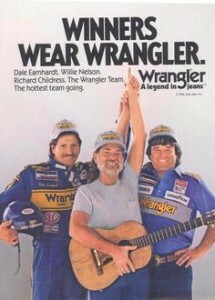 NASCAR legend has it that Dale was persuaded by his wife Teresa to trademark his name and signature and to turn his ”Intimidator” image into a brand. 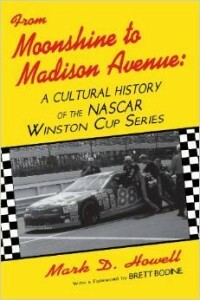 Sure enough the NASCAR memorabilia market grew beyond everyones expectations – $1.34 billion back in 2001 and growing by the race. These days the drivers are known as much by their commercial affiliations as they are by their accomplishments on the track. The 2001 Daytona 500 might have been the first cup race I watched, but I sure knew who Dale Earnhardt was. 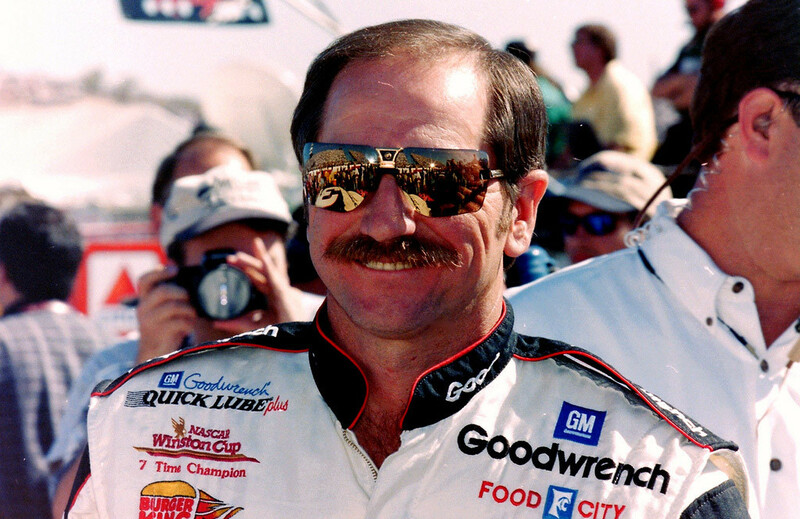 He was the Intimidator, the Man In Black, old Ironhead. That bushwacker moustache, those mirrored sunglasses and that take-no-prisonor driving style had propelled Big E to a kind of epic hero of the South. Fearless and cool. I’d seen him fronting a whole range of products and corporations, not just GM’s Goodwrench Service as advertised on his Chevy race car. A few years later and the focus is on family. 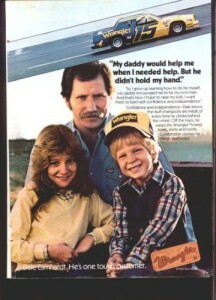 The ad features two of his children and quotes Dale talking about his own daddy, Ralph Earnhardt who had been a NASCAR driver back in the dirt track days. “My daddy would help me when I needed help, but he didn’t hold my hand. “I grew up learning how to do for myself. My daddy encouraged me to be my own man, and that’s how I hope to raise my kids” the copy continues. Comfortable clothes for tough customers. Dale as the rugged family man with confidence and independence, very much a part of the American frontier hero character. Placing a race driver together with a country singing star is one thing. Placing two outlaw characters – Earnhardt and Nelson together makes an altogether different statement. 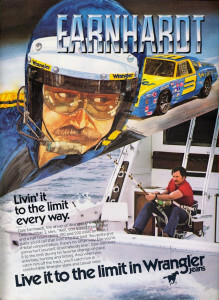 Neither had been seen to play the game, and, as writer Mark D. Howell has it in his book “From Moonshine to Madison Avenue” these print advertisements present Earnhardt as more than a stock-car driver, they present him as a symbol in American cultural mythology, a western outlaw. by Mark D. Howell. 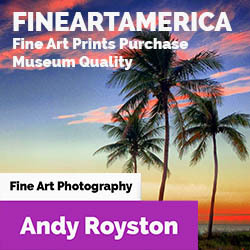 Click to buy it! Others would be less poetic. To the average driver stuck in bumper to bumper traffic in the rush hour every morning Earnhardt drives through traffic, rubbing an bumping his way through the pack. he thought think nothing to give slowpokes a little nudge. Or, if that wasn’t enough, a hard nudge. Dale didn’t let anyone get in his way. He just cut right through and to hell with the consequences, just like smokin’ Joe in the freeway traffic is itching to do. Back at the tracks fans are perhaps wary that their homegrown heroes are being overshadowed by corporate carpetbaggers, rich boy drivers and sponsors’ spin doctors. The personal autograph is still a sign that the drivers are still within the reach, that the drivers are still somehow just like them. Even though Dale’s gone, the signature decals do just fine, keeping memories alive. Dale Earnhardt: NASCAR Photography By Darryl Moran / Flickr Creative Commons. 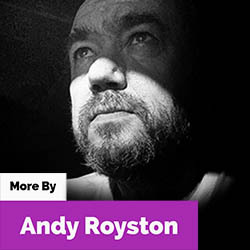 View Darryl Moran’s work here.